Enjoy the video and slides, and then find out what content is trending in your industry and how you can use that content to achieve what Me-Ality did. Check out our industry specific competitive reports here. And here are the latest insights in the fashion niche. Check out our industry specific competitive reports here. Register on InfiniGraph and start learning what BIG DATA we have on your brand, and how we can help you boost your social media engagement, reach and conversions. Click over to our site and check out the free Industry Pages for a comparison of the best and worst performing brands in 40 niches. In this week’s episode of “Future of Engagement,” Murray Newlands interviews Ian Karnell, president of digital-experience designer Buzzhoney, on ways the company creates Facebook content engagement for clients. Karnell discusses the importance of analyzing levels of engagement and monitoring competitors and how they used a social media monitoring tool to assist them. In this video, you can learn how to increase your Facebook page’s reach and keep content engaging. Buzzhoney monitored competitors’ pages to find out what drove engagement with the use of social media monitoring. It’s an advantage to check out pages of others in your field. You can find out what works and what doesn’t for engaging users. Look at the number of comments and “likes.” Once you know what is appealing to customers, you can decide what to post on your page. This way, your content will be what people want and respond to. There are many ways you can keep users engaged on your page. One way is to have a call to action. Content posts that have calls to action tend to engage users more than fan pages. Calls to action can state, “Click here” for a coupon or link to a related website. They can also say, “Suggest us to a friend,” to engage beyond page visitors. This can assist in expanding your network and reaching more fans. Having an engaging feature such as a call to action can increase your fan page’s popularity. Measuring the level of people’s engagement with content can benefit how you use social media. Karnell and his team used a social media monitoring tool called InfiniGraph, which assisted them in finding the most engaging posts that their audience liked. You spend less time going through each competitor’s page and analyzing it by having a program that collects information for you. Once users are on your page, keep them engaged and coming back for more. Investing in tool such as InfiniGraph or Alerti can give you solid results on social data that you can use to your advantage. You can take a lead on competitors and get more responses on your social sites. Watch the video below and get insightful tips from the way Karnell and Buzzhoney handled a client’s request. Ian Karnell – President of Buzzhoney talks with Murray Newlands about The Future of Engagement and how they analyze competitors to develop a strong content marketing strategy. Murray Newlands: Hello I’m Murray Newlands welcome to another episode of “The Future of Engagement”. I’m here with Ian President of Buzzhoney, Ian what do you guys do? Murray Newlands: And, what tools were you using to do this? Ian Karnell: InfiniGraph, I mean InfiniGraph was the only tool to do this, we looked a couple of different tool sets and none of them gave us the breadth and depth of insights we needed very quickly and relatively inexpensive for the value we got back in return. These are priceless insights and there was really no other channel that we would get that type of data to be able to get that type of insights. Measuring the level of people’s engagement with content can benefit how you use social media. Karnell and his team used a content marketing and competitive intelligence tool called InfiniGraph, which assisted them in finding the most engaging posts that their audience liked. You spend less time going through each competitor’s page and analyzing it by having a program that collects information for you. Once users are on your page, keep them engaged and coming back for more. Investing in tool such as InfiniGraph can give you solid results on social data that you can use to your advantage. You can take a lead on competitors and get more responses on your social sites. Watch the video above and get insightful tips from the way Karnell and Buzzhoney handled a client’s request. Also, see example Competitive Brand Intelligence http://bit.ly/ContentSmart here. All of the consumer data available in the online universe has revealed the consumer path to purchase which, rather than a linear sales funnel, is often a long and winding road. At this year’s OMMA Social in New York, Jason Yau showed how L’Oreal’s Professional Products Division (PPD) is using InfiniGraph on their Redken and Pureology brands and leveraging content to steer the social team structure, strategy, and approach. L’Oreal knows that there is an ongoing conversation happening around their brands 24/7. One of the biggest challenges that organizations face today in social media is “social capacity”. Social capacity is the degree to which a brand can effectively engage in social discovery, strategy, and management. All this is used by the brands to curate and steer an audience in a positive direction. Going beyond the traditional sales funnel, there is a new path to purchase. 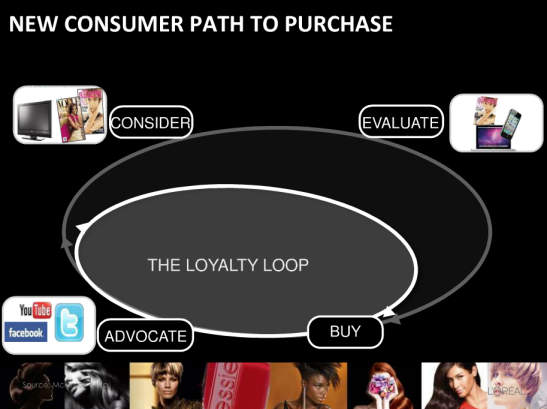 Understanding the consumer’s path to purchase requires following them through 4 touch points. At L’Oreal, the product consideration phase is serious because the consumer is discovering something new or making a connection. People spend a lot of time in the consideration phase engaging their stylist, media sources and their friends moving them from being interested to a desire to try the product “evaluation”. The extensive evaluation process is one of L’Oreal’s key focus points since people are searching for pier to pier recommendations, prompting them to buy. Evaluation is a very collaborative process and also involves more content discovery. The buy side is not the end of the cycle, it’s only the beginning. The next stage is creating brand advocates that have an emotional connection. A carefully nurtured evangelist is required to spread out the target brand’s DNA to the salons and the consumers. Using an authentic tone and voice will perpetuate the organic reach and referrals that can last a lifetime. 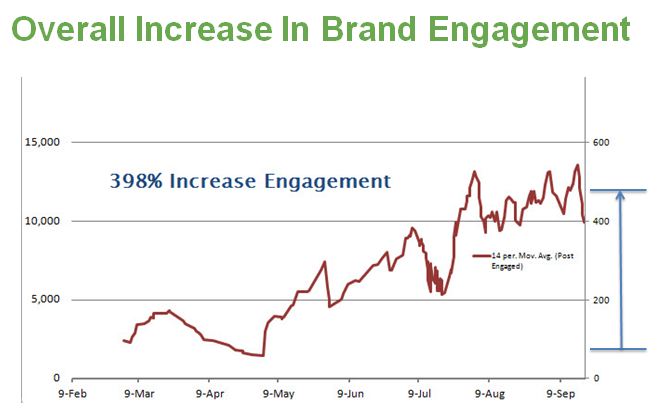 How does a brand maximize their social capacity? By first understanding their strategy of engagement and what they mean to the consumer. A brand must have a clear understanding of what is happening in their industry, what content is working, and be able to answer the “What and Why” before they can create content marketing plans and truly have an understanding of the audience’s willingness to engage. The problem is bridging the gap between content and customer service. It is very critical but without clear strategy and understanding of the consumer passion points you’re just guessing. At the Professional Products Division group, L’Oreal has a 20 person team as part of their “Content Factory” building great content and they clearly understand that “Content is King”. Using this fact, the team strives to create innovation out of the box with social angled content measuring what works and is being continuously altered. All brands should have a content calendar and scheduling capabilities. How does this work? Each month the Professional Products Division has a clear plan on product marketing and cause marketing. Monthly they change their theme. Every department knows that social engagement is at the heart of the plan. They have to think “social by design”, which is a term coined by Facebook. This means that the audience actually cares and will share. For L’Oreal, this is a corporate wide shift in everything they do, with social at the heart of their initiatives. As content is king, using InfiniGraph’s latest release 2.7 and Hypercuration™ L’Oreal is looking at the Redken and Pureology fan bases to hone in on their interests and analyze what content types and sources are achieving the highest resonance. Highly relevant content is then segmented, filtered, and pushed in real time to the L’Oreal content factory. Those resonating, editorial content items are then socially re-angled and pushed out, providing an internal streamlined process that continuously builds more discovery of highly relevant and engaging content. See all the slides here.